Samsung introduced its thinnest range of notebooks during the Consumer Electronics Show held in January. The company unveiled Notebook 9 and Notebook 9 Spin, featuring thinner and light-weight devices in the market. Both these series were bit costlier with a tag of $1000+. In order to compensate this, Samsung launches Notebook 7 Spin with a base price of $800. Let us explore the feature of this convertible Notebook 7 Spin. Samsung launches a 13.3 inched and 15.6 inched versions of Notebook 7 Spin. The 13.3 inched variant measures to be 12.75*8.98*0.78 inches with a weight of 3.9 pounds. The 15.6 inched version is having a dimension of 14.74*10.11*0.78 inches with a weight of 5 pounds. Both these devices are featured by 360 degree hinges which could turn the display panel and keyboard section back to back. This hinge will help you to have three modes for the notebook; the usual notebook mode, tent mode and tablet mode. The display of comes to be 13.3 inches edge to edge for one variant and 15.6 inches for another variant. These are featured by Full HD display screens with a resolution of 1920*1080 pixels. This 360 degree touch display gives you an extra-ordinary experience when you handle the device. This display is packed with Video HDR mode with more crispy colours and texture, which would guarantee an optimized video experience for the users. Both variants function over Intel Core processor. 13.3 inched version functions on Core i5-6200U processor with a processing speed of 2.3GHz. This varianst is enhanced with Intel HD Graphics 520 in addition to a RAM of 8GB. The 15.6 inched version is powered by Core i7-6500U processor with a processing speed of 2.5GHz. This version is supported by Nvidia GeForce 940MX GPU with 2GB in addition to a RAM of either 12GB or 16GB. Both the variants have got extensive storage that extends upto 1TB. The Windows 10 Operating System makes Samsung Notebook 7 Spin even more powerful than its counterparts. With fast charging technology, Notebook 7 Spin can be charged to full in 90 minutes for the 15.6 inched version and in 100 minutes for the 13.3 inched version. The company also promised that by charging for 20 minutes you can use the device for upto 2 hours. Notebook 7 Spin is featured by HDMI port and one USB Type-C port which allow you to transfer data with lot swifter. The device also holds two USB ports of v2.0 along with one USB port of v3.0. Yet another feature of Notebook 7 Spin is the Backlit keyboard. This allow you to use the device even in dim lights. The base model with 13.3 inched display can be purchased with a price of $799. The 15.6 inched is available either for $999 or more based on the configurations. 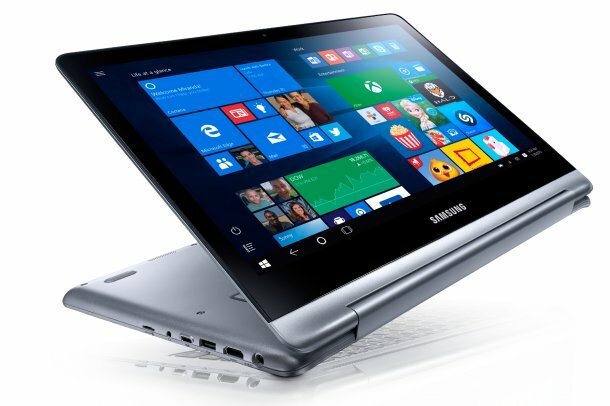 It is promised that Samsung Notebook 7 Spin will be available on www.Samsung.com from 26th June onwards. The device will also be marketed by Best Buy.